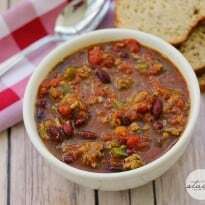 I just love chili and I am going to hit the store and pick up the ingredients to make it this weekend. I’ll try it, just to see how it tastes with the red wine vinegar. (PS, I use tomato paste in my chili). Nice chili recipe. I like the blend of seasonings. 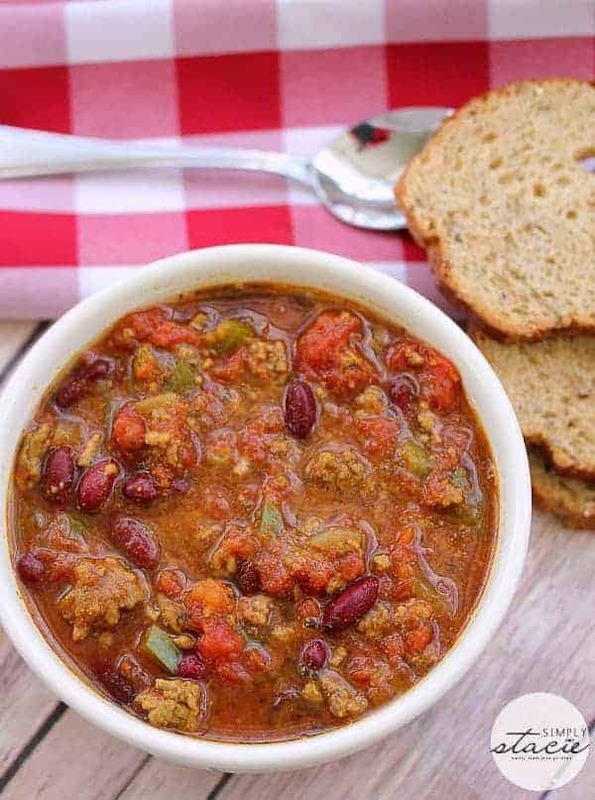 Mmmmm this looks like the perfect bowl of chili – hearty and flavourful! YUM! I have “Pinned” this recipe as well. Can’t wait to try this twist on chili! That looks and sounds soooo amazing Stacie!!!!!! 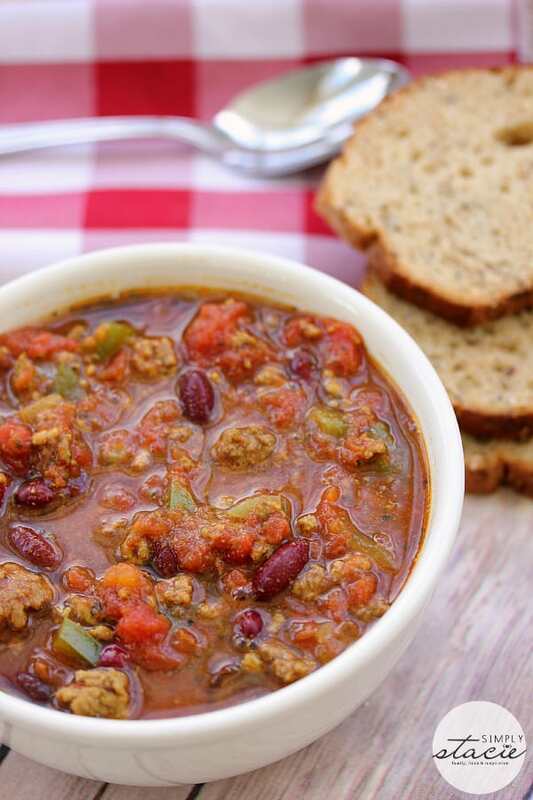 I love chili…..great with cheese, sour cream & crackers. I need to try this recipe. I need to make chili again before it starts getting warmer out! Thanks for sharing!!! This sounds great. It has a lot more ingredients than my chili. I’m going to get the ingredients to make it this weekend. Looks amazing! I put red wine vinegar in many of my tomato dishes. mmmmm that looks absolutely mouthwatering! saved! can’t wait to try it.. thanks for sharing! This recipe looks so wonderful and delicious. It has some spices in it that I have never used in chili nor have I used red wine vinegar in chili before. I’m going to have to make a small batch and try it out. This chili sounds like it would be really good (except for the green peppers). One of these days, we need to make some chili and cornbread for dinner. Thanks for the recipe. Mmm, always looking for a good Chili recipe! 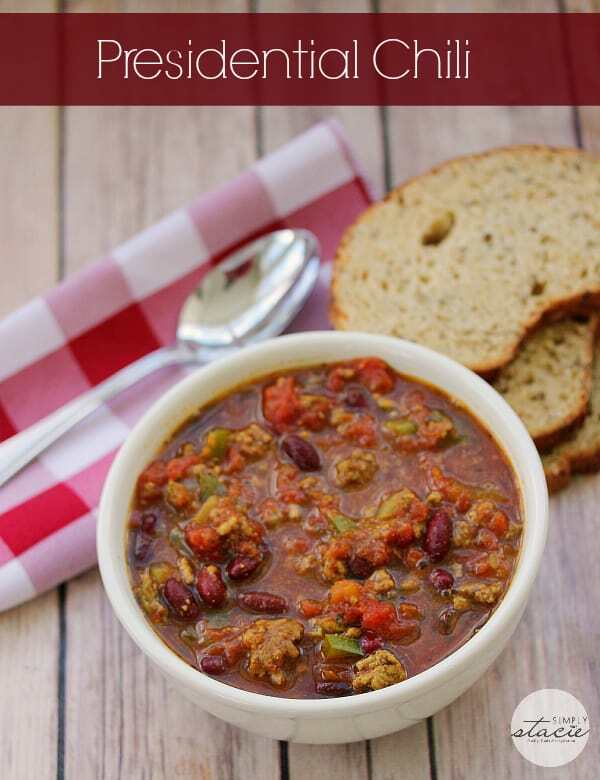 I love this chili Recipe because all the ingredients are so wonderful, and it is easy to make. I bet it tastes delicious, and I am going to make it for my family! Thanks for sharing! Love chili but have never cooked my own, thanks for the recipe! This chili sounds really good and unique. Pinned it and will try it. I have to say though, that your moms chili sounds delicious too! I have never had chili with mushrooms before! Why is that? Lol! I absolutely LOVE mushrooms!! Do you have a recipe for your moms chili that you would be willing to share also, please? I really want to try that! Thanks! I do! I’ll do a recipe post for it soon too. This sounds pretty close to my family’s chili recipe. I’ll have to try the vinegar though! Looks delish!!! I love chili! I love how garlicky this sounds! The red wine vinegar also intrigues me! I love chili! Will have to try this one for sure! I am a man that loves his chili and yours looks really awesome, wish I had a bowl right now. Just looking at the picture makes me want to go make a big pot, thanks for sharing!! 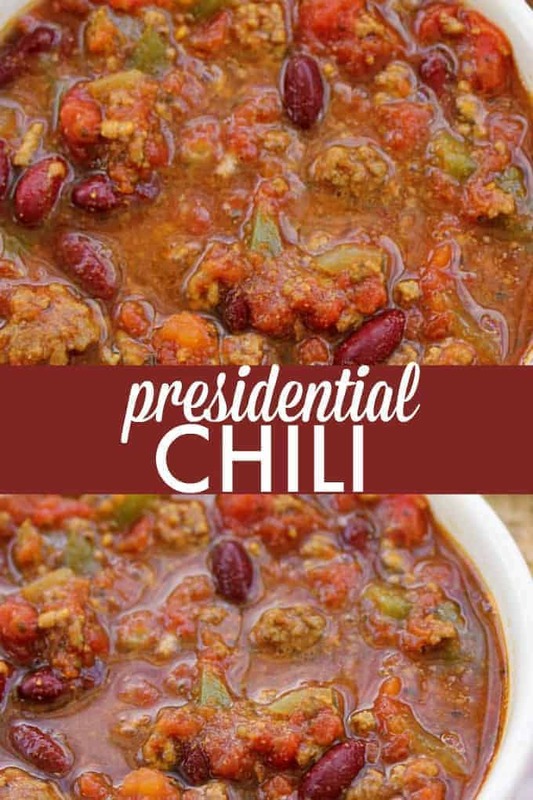 This looks delicious and my family loves chili! I always add some pork & beans to my chili, too, it adds a lot to it! Looks so delicious! I love chili! Looks like a really good recipe !!! I LOVE Chili……….. especially on a cold night, have to have cornbread with it too! Yum…. I am usually not a fan of chili, but this looks delicious. This looks lovely. We’re having chili for supper tonight. I’d try the wine vinegar but I don’t have any one hand. Thanks for sharing. I love Chili of any kind! I never would have thought to add red wine vinegar but I will try it I may really like it! Thank you for sharing!